2011 and the first few months of 2012 marked yet another dynamic period for the Foreign Corrupt Practices Act (“FCPA”) and saw the launch of the UK Bribery Act. The last 14 months included a torrent of enforcement activity, more trials than in any other year in the history of the FCPA, aggressive individual prosecutions by DOJ and the SEC, novel civil law suits piggybacking on FCPA matters, and an increasing interplay between the FCPA and other international laws prohibiting cross-border bribery. Join a webcast with an experienced panel of anti corruption compliance practitioners that will cover the key trends shaping anti-corruption enforcement and provide practical views on how companies can update their anti-corruption compliance programs to meet the many challenges facing business today. 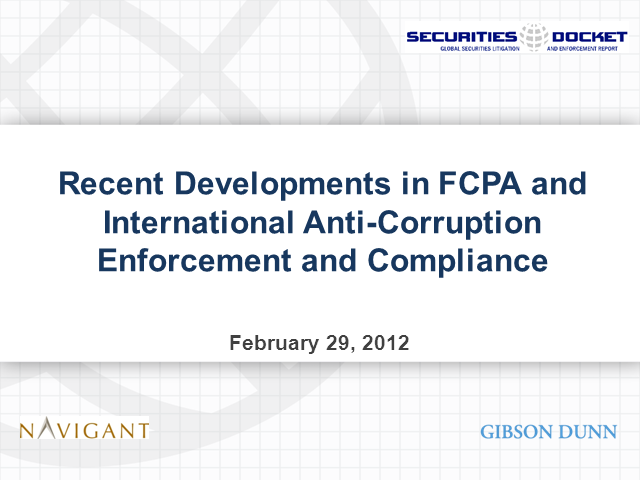 In particular, the webcast will (1) summarize global anti-corruption enforcement trends in the United States, the United Kingdom, Germany and other key countries, (2) recap the latest FCPA trials and their implications, (3) address today’s best practices for establishing and refreshing an effective anti-corruption compliance program, and (4) look at the importance of risk-based third-party due diligence. The panel’s collective knowledge, gained from advising clients daily on the legal and business challenges posed in this area, will benefit directors, senior executives, in house counsel, and compliance personnel alike.